When is the next eclipse in the UK? When is the next eclipse in the world? How can I see an eclipse? An eclipse can be due either to a dark body coming between us and a light emitter, so that we can no longer see the source, or it can be a body coming between a light source and the body that the light is illuminating, so that we no longer see the illuminated body. An eclipse of the Sun occurs when the Moon comes directly between the Sun and the Earth so that the Earth lies in the shadow of the Moon. Because the Moon is much smaller than the Earth its shadow only covers a small part of the Earth's surface and a solar eclipse can only be seen from a restricted area. A total solar eclipse can be viewed from the darkest part of the shadow (its umbra) and areas covered by partial shade (its penumbra) witness a partial eclipse. When the Moon is not at its closest to the Earth its apparent diameter is less than that of the Sun and even where the Moon's disk obscures the Sun centrally, the outer ring of the Sun's disk is still visible. This is called an annular eclipse. An eclipse of the Moon occurs when the Earth lies directly between the Sun and the Moon and the Moon lies in the shadow of the Earth. During a total eclipse, the Moon does not disappear entirely but turns a deep, dark red. The Moon is illuminated by light that has passed through the Earth's atmosphere and has been bent back towards the Moon by refraction. There are between two and five solar eclipses each year with a total eclipse taking place every 18 months or so. Total solar eclipses are seen every 400 years from any one place on the surface of the Earth. Worldwide, there are between two and five lunar eclipses visible each year. From any given location, lunar eclipses are fairly common and can be seen every few years or so. The last time the path of an eclipse's totality went over the UK was in 1999. This was one of the most viewed total solar eclipses, due to its path falling on areas of high population density. Many areas of Western Europe were affected by poor visibility due to clouds. In some places, the clouds frustratingly parted after the eclipse had passed, but others were luckier with the clouds parting just in the nick of time. Many people went to view the eclipse in Cornwall, the only place in the UK to witness totality, with the BBC aiming their coverage in Cornwall's Western end where the eclipse would come first. RTS, the national public broadcaster of Serbia, urged people to remain inside, citing dangers to public health. This caused the streets of all Serbian cities, towns and villages to be entirely deserted during the eclipse, with many opting to watch it on TV instead. The thin path of totality passed through portions of 14 states of America including Wyoming, Kentucky, and North and South Carolina. At least a partial solar eclipse was visible in the rest of North America and parts of South America. More than 12 million Americans live inside the path of totality and more than half of the nation lives within 400 miles of it. Bonnie Tyler performed her 1983 hit ‘Total Eclipse of the Heart’ in a theatre aboard a Royal Caribbean cruise ship. The ship was positioned under the path of totality, with Tyler poised to sing during the eclipse. As always, with any observing event involving the Sun, it should never be looked at directly without the appropriate filters. If you want to look at the eclipse directly and safely there are a couple of options. 1. Check and see if your local astronomical society is hosting a solar eclipse event as they will have many instruments specifically for solar viewing or telescopes that have been fitted with the right filters. 2. If you can’t get out to these events and still want to look at the eclipse directly you can purchase solar eclipse viewing glasses. These must be the real deal – not 3D glasses or anything similar. Some of these may be available in popular astronomy magazines. 3. The safest, cheapest and arguably the most convenient way to view the event is by pinhole projection. This is extremely safe as there is no need to look directly at the Sun and the display can be shared by a few people together. Alternatively you could raid the kitchen drawers for all things holey – whether it’s a slotted spoon, colander or such like. This way you’ll see multiple projections of the event which makes for quite an artistic way to view this rare celestial event! Make a hole in a piece of card. Hold the card up to the Sun and hold a piece of paper behind the card. See the shape of the Sun projected onto the paper - a small version of the event! Ancient myths from many cultures around the world have explained eclipses as a time when an animal or demon eats the Sun or Moon. Even today, modern superstitions exist surrounding eclipses, with some believing that they could harm pregnant women. Scientists have debunked these modern superstitions, however the only precaution you need to take is protecting your eyes when viewing the Sun. For the Ancient Greeks, an eclipse was a bad omen, spelling death and destruction caused by an angry god. The Pomo, an indigenous people from the north western United States, tell a story of a bear who started a fight with the Sun and took a bite out of it. 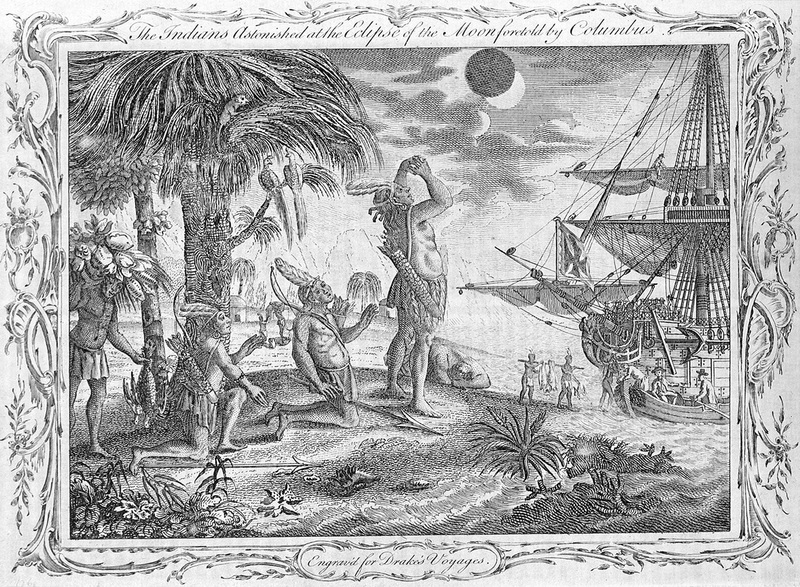 When on an island northeast of Cuba, Christopher Columbus correctly foretold a total lunar eclipse, using his knowledge to play on the native people’s superstitions and persuade them to give him and his men food. Eclipse has been a popular name for ships in the Royal Navy, with eight in total taking the HMS Eclipse title. The first of these ships was a 12-gun, 169-ton gunboat launched at Blackwall on 29 March 1797. The most recent was an E-class destroyer launched at Denny on 12 April 1934 and sunk by a mine in the Aegean Sea on 24 October 1943. This is its boat badge, held in our collection at the National Maritime Museum. During the March 2016 total solar eclipse visible in Indonesia, keen astronomy photographers took out their cameras to capture its beauty. Our 2016 Insight Astronomy Photographer of the Year Award received many striking images from this event. Perhaps in 2018, the judging panel will receive an influx of images from the US event. A group of us went to Indonesia primarily to view the eclipse, but saw many other amazing things too, such as volcanoes and orangutans. We were very lucky. The wet weather cleared in the morning to reveal a hot sunny day, before cloud again came over towards the end of the eclipse. This was my first ever total solar eclipse, and so the first time I have ever taken a photo of it. I am so glad I was able to take a picture of totality and the diamond ring. What an experience it was, one I most certainly will never forget. As seen from Indonesia, the total solar eclipse of March 2016 lasted just over four minutes. It was bookended by a beautiful effect called ‘Baily’s beads’, named after English astronomer Francis Baily. As the Moon moves in front of the Sun, sunlight passes between mountains and crater walls on the rugged lunar surface, appearing from Earth as beads of light around the Moon. Just as totality is reached, and again when it ends, for a second or so only one ‘bead’ is visible. This results in the ‘diamond ring’ effect shown in this photograph. Baily’s beads are very bright and will damage eyesight if observed without protective equipment (Radmila Topalovic, Lead Astronomy Programmes Officer). I took a series of photos of the 2016 total solar eclipse in Luwuk, Indonesia and stacked them to show the dramatic Baily’s Beads formation. I used shots from the second and third stages of the solar eclipse, which are when Baily’s Beads can be seen. Baily’s Beads occur as the Moon passes in front of the Sun. From Earth it seems like the sunlight seen around the edge of the Moon is broken into fragments because the uneven lunar surface obscures some of the light. This creates the illusion of a string of beads encircling the Moon. Sometimes at this stage you can also see what is called the ‘Diamond Ring Effect’ where only one bead of light is prominent. An exhibition celebrating ten years of Insight Investment Astronomy Photographer of the Year Awards will be open at the National Maritime Museum until 4 August 2019.